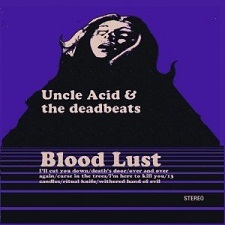 Originally a vinyl-only release by Rise Above Records in 2011, Uncle Acid & The Deadbeats' Blood Lust was selling for £700 on eBay. It was re-released in early 2012, but even the record label's website crashed due to the high demand for the album. The re-re-release is now out on Metal Blade Records, and CD and digital copies are widely available. But--who is this band Uncle Acid & The Deadbeats, and why are so many people willing to pay that kind of money for a record? Well, no one knows exactly who Uncle Acid & The Deadbeats truly are. Only going by the names "Uncle Acid", "Kat", and "Red", fans don't have many details about the band members themselves. On top of that, they have kept a very mysterious persona. There aren't even any live performance photos of this band. This should change, however, in March. The band has shows scheduled in London for the 22nd and 23rd. I can, though, give you some insight into why this band and their album are becoming so popular. Imagine this--Black Sabbath riffs combined with Alice Cooper horror imagery. It's pretty incredible, if you ask me. When a friend first sent me a link to an Uncle Acid & The Deadbeats YouTube video, I honestly thought they were some unknown cult band from the '60s I'd just never heard of before. Obviously that wasn't the case, but it did seem plausible. Blood Lust sounds very much like it was produced to sound vintage. Opening Blood Lust is the track "I'll Cut You Down". It begins with the eerie sound of flipping TV channels. The guitar soon kicks in, and the riff sounds like something from an old Stooges song. It then becomes more Sabbath-esque as the song goes on. The vocals are muffled and quiet compared to the instruments, and it adds to the mystique surrounding Uncle Acid and their music. There is a horror theme in the lyrics right off the bat, particularly with the line, "I lust for women's blood". The part of the chorus with the "I want you, and I need you" lyric is also quite catchy. "Death's Door" follows, and it has a distinctly heavier bass line than "I'll Cut You Down". It is also much slower and has a laid back stoner rock feel. The vocals remain slow and mysterious. I particularly enjoy this track from Blood Lust because of the impressive guitar solo in the middle. I really dig the song titles from Blood Lust. "I'm Here to Kill You" just sounds awesomely evil. The opening riffs of this track almost sound like some old school Maiden or NWOBHM, but it quickly turns more prog rock when the keyboard is added in. The vocals are still muffled, bordering on indecipherable at times. "I'm Here to Kill You" offers a change of pace, as it is the least Sabbath-y sounding tracks so far. And despite all the prog rock stylings and the intense keyboard instrumental, it is one of the shortest songs on the album. My favorite track from Blood Lust is "Ritual Knife". It begins with a heavy and looming bass line. The memorable underlying guitar riff is dark, menacing, and just plain creepy. I wouldn't want to be driving alone in the dark and have this song come on! I initially stumbled upon this song via one of the band's YouTube videos .The video is definitely worth watching. It is styled after a low-budget horror film and is befitting of the band's mysterious and often occult-like image. "Ritual Knife" also boasts a great guitar solo at the end of the song. "Down to the Fire" is a bonus track for the this re-re-release of Blood Lust. It is an acoustic number that gives off a really cool Zeppelin vibe. It is much different from the rest of the album, but it's a worthy addition. Uncle Acid & The Deadbeats' album Blood Lust is a fantastic album--even one of the year's best. My only real complaint is that some of the riffs are repetitive and overused. For instance, the track "I'll Cut you Down" sounds an awful lot like the track called "13 Candles". That kind of threw me off the first time or two I listened to the record, because I thought the first track was somehow repeating itself or being revisited for whatever reason. Other than that, I can't say anything bad about Blood Lust. Frequent readers of this site probably know that I'm always excited to hear bands that incorporate a classic or "vintage" sound into their material. I am especially pleased about a band like Uncle Acid & The Deadbeats, because their music goes so far back to such an early period of metal. I can't wait to hear what they do next, and I won't have too much longer either-- a brand new album is slated for release in March of 2013.